The scene of the February 4, 2019 bomb in Mogadishu. 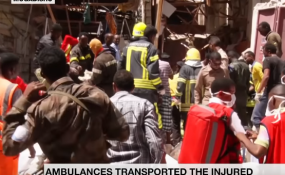 Twin incidents of terrorism shook the African nation of Somalia Monday. The first incident took the life of Paul Anthony Formosa, a Maltese national who was the manager of the port of Bosaso in semi-autonomous Puntland state for P&O Ports, a subsidiary of the Dubai-based DP World. P&O Ports acknowledged that one of its employees was killed and three others injured in an "incident" Monday at its operations in Bosaso Port. The company said that an investigation is ongoing. P&O Ports signed a 30-year, $336 million deal in 2017 to develop the Bosaso Port. The al-Qaida-linked al-Shabab extremist group has taken claim for the attack. "We are behind the operation ... we had warned him but he turned a deaf ear. He was illegally in Somalia," said spokesman for al-Shabab's military operations, Abdiasis Abu Musab. P&O Ports has sparked friction with Mogadishu over its development of ports in Berbera in breakaway Somaliland -- whose independence is not recognized -- as well as Puntaland. Puntland is a region of northeast Somalia on the Gulf of Aden. Al-Shabab also claimed responsibility for the second incident, in which a car bomb went off in Mogadishu killing 11 people. "The blast occurred close to Mogadishu mall and it has caused death and destruction. Nine civilians were confirmed dead and several others are wounded," according to police officer Ahmed Moalin Ali. Somalia has not had an effective central government since the 1991 overthrow of president Siad Barre's military regime which began decades of chaos, including an insurrection by the Shabab since 2006. The extremist group once controlled large swaths of the countryside and the capital, however they were chased out of Mogadishu by the 22,000-strong African Union peace-enforcement mission, AMISOM in 2011, and have since abandoned many strongholds.